English Civil War battles were significant in the scope of British history but they were not arrayed in the manner of a typical war. Although this was a civil war, and the whole country was affected, there were remarkably few major battles. 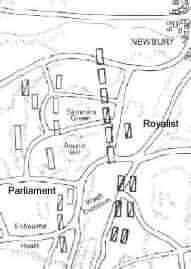 Both the Royalist and the Parliamentary armies were on the move. Charles’ army, commanded by the King himself, was marching from Shrewsbury to London while Parliament’s army, under Robert Devereux, third Earl of Essex was marching from London to Worcester. When the armies were a few miles apart, Prince Rupert persuaded Charles to take to the high ground at Edgehill. Essex realised that the Royalist army was close and formed his men for battle. Both commanders deployed their troops in the same way with infantry in the middle and cavalry to the flank. The Parliamentary army opened the battle with a volley of cannon fire. Prince Rupert led a Royalist cavalry charge on the right side of the battlefield and the Parliamentarians fled. Meanwhile another group of Royalist cavalry charged the left side of the field and the Parliamentarians fled. If the Royalist cavalry had rejoined their army it is likely that the Royalists would have won the battle. However, both cavalry commanders chose to pursue the fleeing Parliamentarians leaving Charles without a cavalry regiment. Seeing that he now had an advantage, Essex commanded a general assault on the Royalists. Although the Royalists held ground for a while many soon decided to run. However, Essex had thought of this and had sent a cavalry regiment to the back of the field to cut down any who chose to flee the battlefield. They did not get the chance to do this as Prince Rupert had returned with his cavalry. The light was giving way to darkness by now and as both sides were exhausted it was decided to call the battle a draw. The Royalists were well supported in the North of England. Knowing that he had a lot of support the Royalist commander, William Cavendish, Duke of Newcastle, decided to try and enclose the Parliamentarian army in Bradford. However, Fairfax, the Parliamentary commander decided that his army had a better chance of survival if they fought the Royalists in a battle rather than being surrounded and forced to surrender. The two armies met at Adwalton Moor, an area covered with fields enclosed by fences and hedges. This was not good country for the Royalist cavalry and Fairfax knew that this would give him an advantage even though his army was heavily outnumbered. Fairfax decided to adopt a defensive position and successfully withstood several Royalist charges. Feeling optimistic that they were successfully withstanding the Royalists and forcing them to defeat, several groups of Parliamentarian soldiers decided to pursue the Royalists rather than maintaining their defensive line. 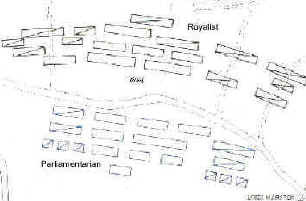 The Royalists were able to easily force the split Parliamentarians to retreat to Bradford. The Parliamentary commander Sir William Waller, had managed to push back the Royalist army, commanded by Lord Hopton, to Devizes. Knowing that the Royalists were in a bad way and having seen a company fleeing for Salisbury, Waller allowed his army to have food and rest before mounting a final assault on the Royalists. What he did not realise was that when they reached Salisbury the Royalists turned North to seek help. Lord Henry Wilmot was the Royalist commander who led a force to assist Hopton. When Waller realised that Hopton was approaching he took up battle position on Roundaway Down, just north of Devizes. He positioned his infantry in the middle and cavalry at the sides. The Royalists were the first to charge and for some reason there was no Parliamentarian counter-charge. After two more charges the Parliamentary cavalry had fled. Waller then turned his attention to the Parliamentary infantry. 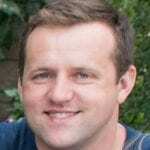 However, they stood firm until a force led by Hopton attacked them from behind. Caught between two Royalist armies the majority of Parliamentarian soldiers simply fled from the battlefield. Robert Devereux, third Earl of Essex, had marched from London to Gloucester to re-supply a Parliamentary army. On his return journey he was attacked by a small company led by Prince Rupert, who wanted to slow his return to London. Rupert managed to slow the Parliamentarians enough to allow Charles I to reach the Parliamentarian town of Newbury before Essex. Charles positioned his army across Essex’s route ensuring that the Parliamentarians would have no choice but to fight. As the two sides were stationing their soldiers, Charles foolishly allowed the Parliamentarians to station a battery of artillery and a company of infantrymen on Round Hill. The Royalists chose to attack Round Hill first. However, they were unable to mount a successful attack because the area was covered with hedgerows and bushes making it difficult for the cavalry to be effective. The Royalists suffered a number of losses and were driven back. A second Royalist attack on Round Hill was more successful and the Parliamentarians were pushed back. But the Royalist cavalry had been badly fired upon and no further attacks were made. The battle was declared a draw. Prince Rupert was marching across the North of England to relieve a Royalist army trapped in York. News of Rupert’s position in the North reached Oliver Cromwell, the Parliamentary Lieutenant General, and an army was sent to meet the Royalists. Rupert outmanoeuvred the Parliamentarians by sending a cavalry detachment south to Marston Moor while taking the rest of the Royalist army to York and then to Marston Moor by a Northern route. Meanwhile, Rupert sent a message to William Cavendish, Duke of Newcastle, to meet him at Marston Moor. The combined Royalist forces were outnumbered by the Parliamentarians but decided to fight anyway. They reached their battle positions in the early evening and assumed that the battle would not begin until the early morning. Unfortunately for them the Parliamentarians had decided to mount an attack that evening and the Royalists were totally unprepared for the attack. For the first time since the Civil War had began. Rupert’s cavalry, at one end of the field, were beaten by a Parliamentarian cavalry charge. Things were better for the Royalists at the other end of the field where the Parliamentarians had been beaten back. Having defeated Rupert, the Parliamentarians were feeling optimistic and successfully defeated the Royalist infantry, killing those who did not flee. Charles positioned his army so as to defend the northern border of Newbury. He knew that he had a strong position and hoped that the Parliamentarians would not attack until Prince Rupert had joined him and strengthened his army further. The Parliamentarian commander, Edward Montague, positioned his army on the north-eastern ridge. The Parliamentarians knew that it was going to be difficult to defeat the Royalists so they embarked on a daring plan. Sir William Waller led a large force of Parliamentarians around the edge of the Royalist army. As day broke on the 27th October, Edward Montague and William Waller attacked simultaneously. Waller succeeded in taking a Royalist outpost but made no further gains. Meanwhile the Royalists managed to hold off the attack by Montague. The battle lasted all day with the Royalists sandwiched between two Parliamentarian forces. Each time the Parliamentarians made some gains they were beaten back by the Royalists. Heavy losses were sustained by the Roundheads. By nightfall, both armies were exhausted and Charles decided to retreat to Oxford. Although Cromwell wanted to pursue the Royalists, he did not have the backing of his army commanders and the Royalists were able to flee the battle scene safely. The Parliamentarian, General Fairfax, had laid siege to Oxford in a bid to lure Charles into battle. Hearing that his Royalist ‘capital’ had been placed under siege Charles had immediately marched to Oxford to release the city. As Charles neared Oxford, Fairfax broke the siege and marched north to meet Charles. Not wanting to be forced into battle against Fairfax, Charles turned north. Unfortunately for the Royalists, they could not outmarch the Parliamentarians and had no choice but to turn and fight. They took up a good defensive position and waited for word of Fairfax’s position. Prince Rupert discovered that the Parliamentarians were camped near Naseby and suggested that the Royalists should advance on Fairfax. The decision to advance was taken and the Royalists left their strong defensive position to make an attack. This was not a good decision as Fairfax had deployed his army in a very strong position, going so far as to hide some of his troops from sight. Both sides took up their usual positions with infantrymen in the centre and cavalry on the flanks. The Parliamentarian cavalry were commanded by Oliver Cromwell and Henry Ireton, the Royalist cavalry were commanded by Marmaduke Langdale and Prince Rupert. The Royalist cavalry, under Prince Rupert, made the first attack and pushed the Parliamentarian cavalry back. Meanwhile the Royalist infantry had some success over parliament. However, Langdale’s cavalry had not fared so well, they had been pushed back by Cromwell. The Parliamentarian New Model Army then took to the field concentrating mainly on the Royalist infantry. Charles’ army were unable to withstand this new attack and many foot soldiers surrendered. The battle lasted just three hours and in that time most of the Royalist foot soldiers were killed or taken prisoner. The Royalists also lost all of their artillery and most of their baggage. Charles fled the battlefield as soon as it became apparent that he had lost the battle.